The snake’s head fritillary is an unmistakeable naturalised wildflower. Distributed around Europe and West Asia, it’s usually seen in grasslands, damp soils and river meadows. Although, it is rare to see this beauty in the wild in the Great Britain, due to change of land use. Often seen in horticulturists gardens having been cultivated ornamentally since Tudor times. 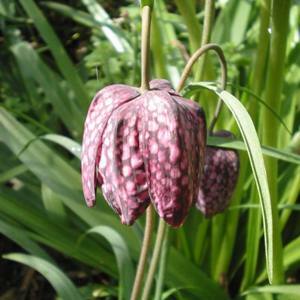 Fritillaria meleagris has slender foliage, with square shouldered, bell shaped flowers, singularly or in pairs, often purple, pink or white in colour with a distinctive purple pink chequered pattern. It grows well in areas with a cool damp summer, in full sun or partial shade with moisture retentive soil. A great spring flowering bulb that is suitable for rock gardens, woodland gardens, raised beds or for naturalising in grass. Watch out for the lily beetle which feeds on fritillarias after it’s winter rest.